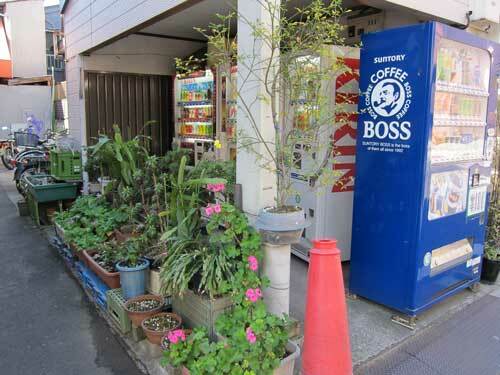 Vending machines are everywhere in Tokyo: providing convenience, wasting energy, and masquerading as animate robots. I wonder if it was the property owner or a neighbor who decided to grow twenty plants in front of these four vending machines, including this pretty yellow flower in a recycled container. I like how recycled materials are used to create multiple levels in this potted garden. It’s amazing how this concrete pad now includes the machines a path to access them, and a three level deep garden. Equally amazing are all the balcony gardens. Even those without sidewalk access make space above the air conditioners and below their laundry lines for a variety of plants. Some are in ceramics, others in the rubber pots from the nursery. 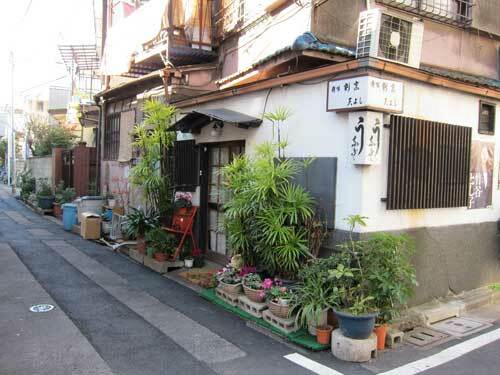 Old Tokyo neighborhoods like Zoushigaya are full of plant lovers who manage to create gardens where there is almost no space. This type of passion for gardening cannot be replicated by large scale developers. What is amazing is the ingenuity and sheer variety of plants grown by residents. Above there are five or more plants growing vertically along a narrow path that would otherwise be a grim cinder block and metal siding wall between properties. The gardener seems to have used large blue laundry clips to espalier these hardy plants. To the left you can see how a corner garden softens the edge of the street and marks the change of seasons. Just as the house reveals that the structure has been added to over time, you can see a mix of mature plants, including raphis palms, with recently bought annuals. Again, all sorts of readily at hand materials are recycled into the garden, including astroturf, cinder blocks, and the red folding chair. While I like the chaos of this garden, the one below shows how you can have a no flower, more traditional looking Japanese garden growing in the intermediate space between residence and street. The trees look mature and regularly trimmed. The last images show the beauty of a single plant that has found its way through one of a series of regularly placed holes in a cement wall. I think it’s very pleasing to see a hardy plant bringing life to a hard surface. I wonder if this effect of private public space blurring was intentional or accidental? On our walk through Zoushigaya, we came across this mature yuzu tree, growing in the small space between the street and a residence. Yuzu is a special, perhaps only in Japan citrus fruit. 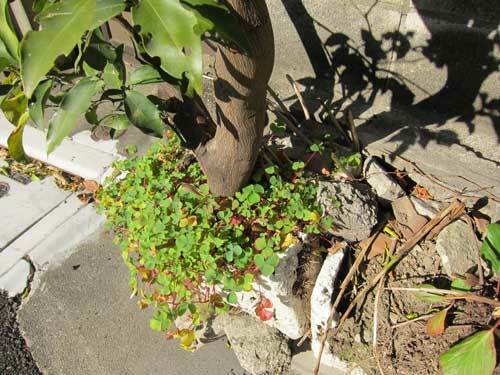 It’s also another example of how a tree planted in a styrofoam container managed to send roots through the disintegrating styrofoam, down a sidewalk crack, and into the earth below. It is amazing what a great climate Tokyo provides for plants to go renegade. We also saw this gorgeous orange tree full of fruit. The oranges, the old house, and the hill above make you feel that you are far from the big city. My friend Eri, a pianist and music teacher, invited me to go for a walk near her college in Zoushigaya. I wasn’t sure what to expect since I had never been there and it’s close to Ikebukuro, an area that always seemed to me like a lesser Shinjuku. Eri’s tour from Gokokuji to the Kishibojin shrine was delightful: narrow streets, lots of sidewalk gardens, and a Shitamachi feeling. We ended the walk with a warm soba lunch. My favorite image is this public train set in a rather barren raised garden on a small street across from a cemetery and the music school. The owner left a sign inviting passer-bys to enjoy his battery-operated train. And to please remember to turn it off when they leave. What a remarkably generous idea. I also thought only in Japan would people remember to save the battery; in my city, it would be quickly stolen and resold for spare coins. I will post photos from this winter walk over the next few days. Below is an image of a small unpaved lane. I like how it has a rustic feel, and you can sense the vibrant life of residents, a carpentry shop, plants and bicycles. The New York Times recently reported that Chicago residents are increasingly keeping pygmy goats in their back yards, joining chicken coops and beehives as elements of new urban farm life. Pygmy goats grow to two feet in height and 50 to 100 lbs. They provide milk and cheese (for some reason, it is illegal to sell these in Chicago) and they can also mow the lawn and provide fertilizer. There was also an article over two years ago about pygmy goats being legal in Seattle. Clearly, they are also adorably cute! My in-laws have been teaching ceramics in Tokyo for over 30 years. I recently helped them relaunch the website for their Shiho ceramic school in Suginami. Please have a look. The website is in Japanese, but very visual. The classes attract an interesting mix of first timers and serious hobbyists, Japanese and foreigners. Several students have developed their skills over five years or more and have solo shows. Everyone participates in an annual student show, as well as special events like climbing Mount Fuji in the summer, bizen pottery in Numazu (wood fired ovens), bowling parties, and mochi-making parties. For me, pottery has been a way to experience Japan’s famous soil, and to create dozens of flower pots for my balcony garden. In addition to the pottery wheel, you can make pottery through hand forming and shaving, or through forming slabs and using molds. Pottery is fun and connects students with each other and the earth. The website illustrations are by Kuge Shu. Tokyo’s mild winter is amazing. All these photos of winter flowers are from yesterday, January 20, 2010. Ranging from natural to forced, outdoors to indoors, the flowers include early plum blossom along an urban path to a red tulip in a sidewalk garden, to a mini daffodil at home. 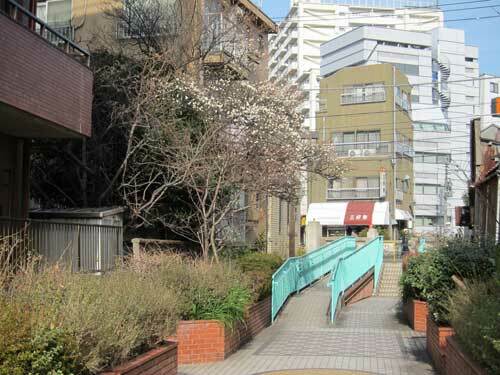 Starting a week ago, this plum tree along a walking path to Nakano JR station began opening its petals. The tree extends from a private garden into a public path. After November and December’s camellias (and my balcony pink camellia is still blooming), the winter plums suggest that there is no month in Tokyo without flowers blooming naturally. 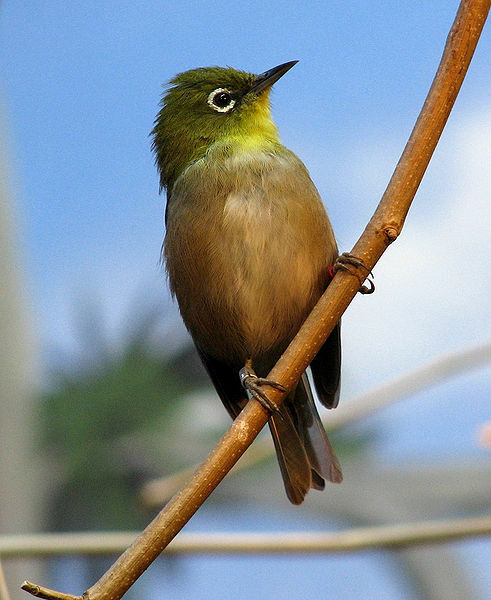 My husband saw bright green mejiro birds in the tree later that day. 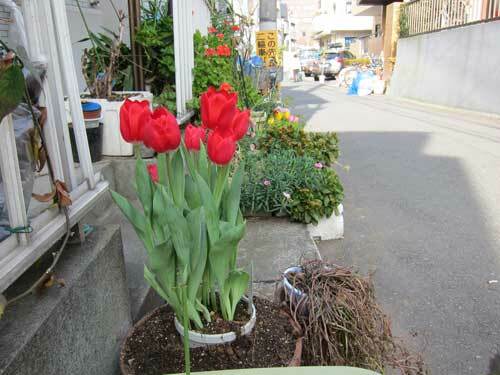 I also noticed these bright red tulips in a Nakano sidewalk garden that I often pass. It’s the garden that was growing rice in styrofoam containers last year. The gardener has planted some bulbs, but she’s also added some hothouse-forced bulbs to her charming public garden. Because frost is so rare, the tulips can thrive even in mid-winter. I also saw another neighbor cutting roses from her sidewalk garden. Pansies are also common in winter. 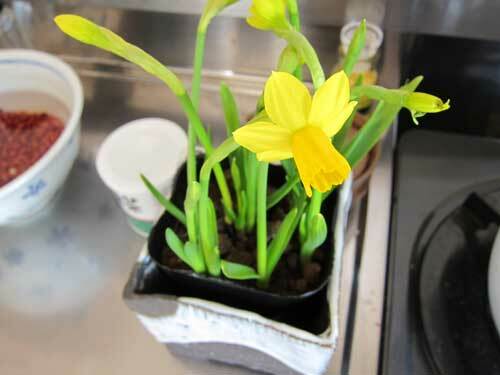 Lastly, inspired by all this winter color, I bought some mini-daffodils for my home. Indoors, they go from bud to bloom incredibly fast. The bright yellow cheers up the apartment and fools me into thinking that spring is not so far away. What flowers do you enjoy in winter? They urge a decentralized and highly participatory urban renewal with government investment in infrastructure and dense, low-level structures built by local efforts. I like their view that cities are about resourceful people and not large-scale developments. It is particularly timely to remember now how Tokyo rebuilt after the war (and the 1923 Kanto earthquake) and became a megacity that combines futuristic elements with a vibrant civic life. 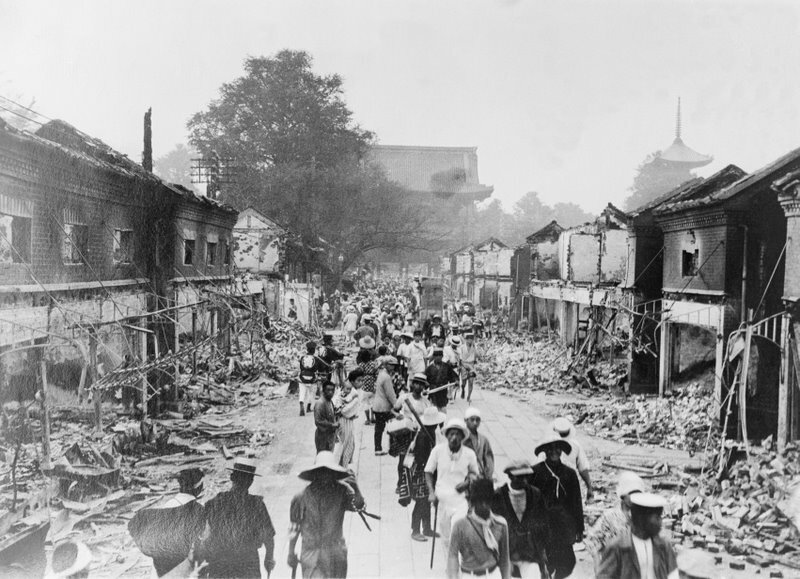 You can learn more about their work at Urbz, “user-generated cities.” Below is an image from the Japan Society website of the 1923 Kanto earthquake in Tokyo. Portland, Oregon is redesigning its streetscapes to create hundreds of new sidewalk plantings that capture stormwater runoff. As you can see in the photo from Portland’s Bureau of Environmental Strategy, these greenstreet projects not only relieve the burden on the sewer system from heavy rainfall, but also add plant life to public spaces, make streets more pedestrian and bicycle friendly, and provide habitat through native plant selection. When it rains, stormwater runoff that isn’t properly managed can flow over impervious surfaces picking up pollutants along the way and washing them into rivers and streams. Stormwater runoff can also cause flooding and erosion, destroy habitat and contribute to combined sewer overflows (CSOs). Stormwater management systems that mimic nature by integrating stormwater into building and site development can reduce the damaging effects of urbanization on rivers and streams. Disconnecting the flow from storm sewers and directing runoff to natural systems like landscaped planters, swales and rain gardens or implementing an ecoroof reduces and filters stormwater runoff. Although I am now living in Tokyo, across the Pacific in San Francisco I have a public garden that extends onto the sidewalk. 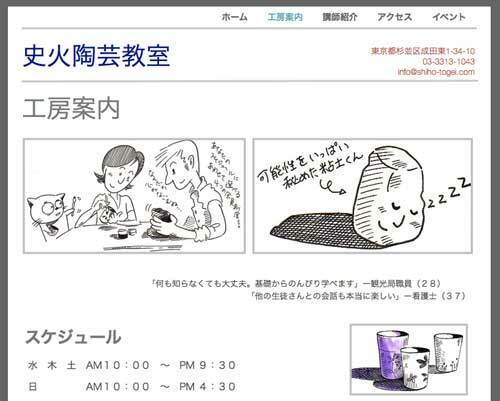 Last week I heard by email from a neighbor that he called the police non-emergency number at 7 in the evening because someone was sleeping in front of my building. A few days later a friend asked if I knew that my plants got “smushed” and then Twittered the photo above. The photo above shows the damage and garbage left behind. Although I have marveled at the safety of Tokyo streets that permits salary men (and ladies) to be passed out in public, Tokyo people are shocked when I tell them how filthy the streets of San Francisco are. Garbage, vandalism, and thousands of people living in the streets with obvious mental health and heavy drug addictions. I have no easy answer for the break-down in social bonds that allows so much human misery to exist in public in the world’s richest country. In my observations, the wealthy of San Francisco live on hills that are either inaccessible to the homeless or policed more severely; the wealthy use private automobiles and ignore the streets. Those in mixed income neighborhoods become accustomed to dirty and unsafe public streets, and make themselves comfortable inside their homes. Streets are the largest public spaces in any city. It is sad when they are feared more than enjoyed.